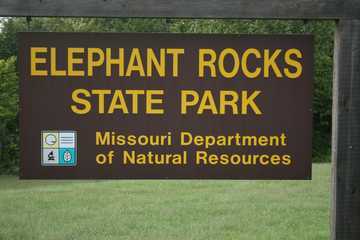 Among the many nearby geologic attractions in Missouri’s ancient granite St. Francois Mountains, the most curious is the herd of ponderous pink pachyderms in Elephant Rocks State Park. Here, over time, weather and water have sculpted a vast outcrop more than a billion years old into massive rounded behemoths. 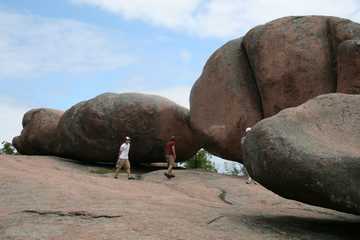 Many of the elephant rocks are within the 7-acre Elephant Rocks Natural Area. The largest of the herd, Dumbo the patriarch, stands 27 feet tall and measures 35 feet long by 17 feet wide, tipping the scales at a hefty 680 tons. Dumbo and the rest of the herd stand end-to-end like a petrified train of circus elephants, marching across an expansive bare granite bald. A circular loop trail, one mile in length, leads around the entire herd. This route is named the Braille Trail, as it can also accommodate people with visual or physical disabilities. Along the trail or its side branches are the “Fat Man’s Squeeze,” a narrow gap between two huge boulders, and “The Maze,” where visitors wander 100 feet among blocks of broken granite slabs.